Welcome Funds has established an institutional funding network that consists of the industry's leading life settlement providers. These professional buyers are licensed as life settlement providers across the U.S. and are authorized to purchase policies from life insurance consumers. We maintain relationships with the most active and reputable life settlement providers within the secondary market and consistently add new institutions to our network as this asset class grows more popular in the capital markets. In order to ensure that our customers receive fair market value for the sale of their life insurance policies, we create a "market," or auction for each policy by negotiating with multiple life settlement providers. These licensed institutions must compete for the highest bids in order purchase each policy. 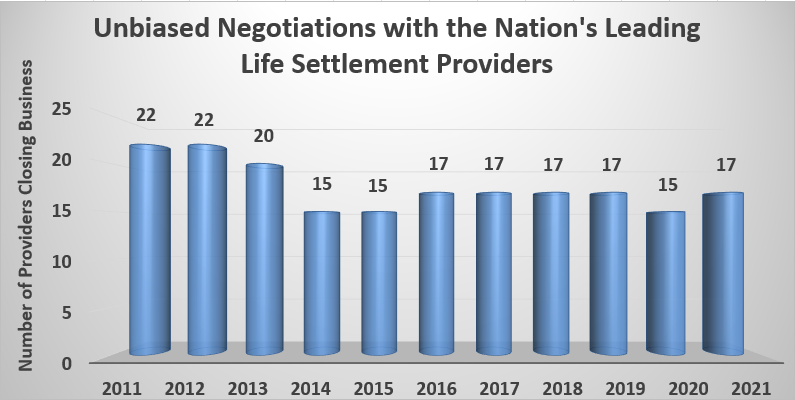 As evidence of our unbiased approach to securing fair market values for our clients, below is a review of the number of life settlement providers that Welcome Funds has closed business with annually for the past 6 years.